I wear several different hats; in one, I practice an aggressive brand of preventive cardiology and heart disease reversal. In another role, I serve as an impartial medical expert, reviewing records from other doctors and hospitals where patients have experienced bad outcomes, often death. Just this week, I reviewed a file of a 50-year-old male smoker who went to the emergency room with two days of chest pain. He had minimal testing, and was released in an hour with instructions to see his family doctor in a week. Sadly, he died of a heart attack three days later. This is all too common. While not all deaths can be foreseen and prevented, I've created a list of questions to ask and tests to request from your healthcare providers, whether during routine office visits or trips to the ER with chest pain. Hopefully this will prepare you for dealing with an overtaxed medical system and protect you from heart damage. A CACS is by far the most accurate way to determine if your heart arteries are silently suffering. The heart gives no warnings until the arteries are badly blocked, and the first symptom you have may be the day you die. In my community, this widely available CT scan costs $80, uses no dye, and takes one minute. It's far more accurate for screening your heart than a stress test. 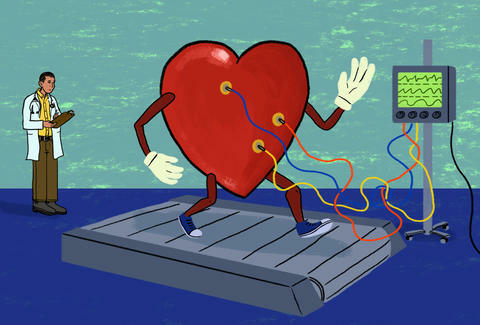 Your score should be zero, and anything higher should prompt you to see a preventive cardiology expert. For starters, don't go to an urgent care clinic with chest pain, pressure, tightness, squeezing, or compression. Go to an emergency room. That said, ERs have pressure on them to turn over rooms. I've reviewed charts from dozens of young people sent home with cursory evaluations, only to die or be maimed by massive heart attacks within days. Bottom line: DON'T GO HOME without a thorough evaluation. Second, ask for "serial" cardiac enzymes that are repeated two or three times, every four to six hours. Third, ask for a repeat ECG to compare to the one you got initially. Finally, ask for a definitive test before discharge. This may be a treadmill stress test with echocardiography (no radiation) or nuclear imaging (radiation). In some ERs, the CACS or the advanced coronary CT angiogram may be available. If you're not severely allergic to iodine dye, this is by far the most accurate way to be sure your arteries are clean. If they aren't clean, a cardiologist will have to evaluate your status, but you'll know the score and -- most importantly -- be alive. Advanced lipid profile: Rather than giving you an LDL cholesterol level, advanced panels measure LDL particle number and size, which are more predictive of future heart and stroke events. Two people with the same cholesterol levels can have widely different particle and size measurements, making for very different risks. Lipoprotein a: This is a genetic form of cholesterol that's elevated in about 20% of those tested. It's rarely drawn, even though hundreds of research studies indicate that if it's high, the risk of heart attack and stroke skyrocket. There's even a foundation dedicated to educating the public of the risk. Homocysteine: This amino acid is produced by a process called methylation. It's important for artery and brain health, and when elevated, it may be due to a genetic defect in the MTHFR gene, which is also easily measured. It can be treated with methylated B complex vitamins, and the level will return to normal. Inflammatory markers: The best known is hs-CRP, but there are at least five others I measure in my practice, like MPO. If there are markers of inflammation in the blood, a hunt is on for insulin resistance, infections, food allergies, skin conditions like psoriasis, a diet rich in processed foods, central obesity, gingivitis, and sleep apnea... among others. Inflammation can be reduced by addressing these root causes. TMAO: This is a newly described marker of heart and kidney health that's elevated after eating meat- and egg-heavy diets with an altered gut microbiome. It has been shown to cause heart and kidney damage, and is associated with worsened prognosis -- if you have high levels of this, you may want to make a transition to a more plant-based diet. Years ago, a routine physical included an electrocardiogram (ECG or EKG) but it's often skipped now. I suggest it for one particular reason: the measurement called the QT interval, which is the time between two waves in your heartbeat. A segment of the population has a genetic defect that causes the QT interval to be prolonged, and some people are prescribed drugs that prolong the QT interval. A long QT can result in death from a cardiac arrhythmia, and a number of medications have been pulled off the market due to this side effect. Knowing if you have a prolonged QT interval before you're prescribed antibiotics, antidepressants, and other medications is key. Many hospitals offer a vascular-screening program using ultrasounds of the carotid arteries, abdominal aorta, and legs. While they're rarely definitive, they can offer a good value if you're a smoker or have a family history of early heart disease or stroke. Arteries should have no plaque, so the presence of "mild" plaque should prompt you to have a complete evaluation by a vascular expert. There are so many potential drug interactions and some of them are deadly. Some of them center on the long-QT syndrome found on your ECG mentioned above. There are online resources to check your list of medications for interactions, particularly if you are prescribed a new medication. Antibiotics are particularly frequent causes of drug interactions that can be avoided with proper research online. While I favor natural medicine and therapies emphasizing healthy lifestyle choices, there are genetic and acquired health issues that can be identified and addressed with proper evaluations. Heart issues are the focus of my quarter century of practice, but these lessons are true of other conditions (e.g., a bad headache not fully evaluated in the ER). Don't be afraid to challenge, ask why, read, and refuse to go home before proper testing is performed. My hope is that I'm never sent a medical chart to review with your name on it. Dr. Joel Kahn is a cardiologist who practices in Detroit. His book, Dead Execs Don't Get Bonuses, details how to prevent and reverse heart disease. Follow him @drjkahn.